You should show Your fish, and I would love to see You join the club . I hope you all take lots of pictures! Let's see Koi and Koiphen Members! ZNA Koi judges will discuss Sanke (Quality of the Body, Sumi, Shiroji, Beni and blood line). The judges will use live Sankes to make comparison. Grand Champion - Star Milling Co.
Best in Size - Up Right Trading Corp. Announcing the So Cal ZNA Koi Show Judging Seminar . Friday March 15th at 2pm . Andrews Koi has graciously provided five Nisai Kohaku in the 50-55 cm range for all participants to study. The Seminar will include a classroom session with study materials , and a hands on pond side session with live fish. Come and learn with ZNA Judges , learn how to choose quality Koi , and improve Your Koi picking skills . The Seminar is open to ALL and there is a $25 fee to participate. Thank You CM Process Solutions for your generous donation. 2019 Koi Show ALL 1st., 2nd., & 3rd Place Sponsor. Last edited by ricshaw; 03-08-2019 at 07:41 PM. 2019 Koi Show 1st., 2nd., & 3rd Place Sponsor. So cal Koiphen members that visit the So Cal ZNA Garedena Show this coming weekend March 16 th , please help select the recipient of The Koiphen WWKC Friendship Award . If OCKOIFAN has average grade fish that I have less than average in my pond. Im going to be there to learn and talk koi Superb venue and had a lot of fun last year. Thank you WWKC for the WWKC Friendship Award. ricshaw is NOT a member of WWKC. 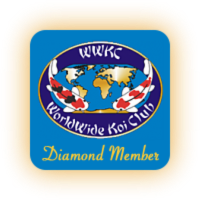 Only a member(s) of WWKC should pick the WWKC Friendship Award Koi.